Bell Mountain Wilderness is in Iron County Missouri, around 30 miles south of Potosi. The Bell mountain trail is an 11 or so mile loop depending on the trail head you start from. Bell Mountain is 1702 ft. and offers superb views to the east and of the 600 ft. drop into the very steep valley of Shut-in Creek. Bell Mountain is part of the St. Francois Mountains, one of the oldest geological formations in North America and it’s quite different to the karst geology in the west of the state. See Getting to Bell Mountain Wilderness below. The Bell Mountain trail is fairly easy going. The surface is generally good and there are only two major climbs/ascents on the main trail loop (the descent and climb out of the valley of Joe’s Creek). If you start the trail at the Western Ottery Creek trailhead, it’s a different story. From there the trail starts with a 770 ft. climb to get up to the Bell Mountain ridge where the trail joins the Bell Mountain trail loop. You can read more about Bell Mountain on the Forest Service web site. The official brochure can be found here though we found the trail map in the brochure a little difficult to read. We were last at Bell Mountain Wilderness in March 2012. At the time there was water in Joe’s Creek and in the ponds marked on our map. Download the kmz file for Google Earth or downlooad this version for your GPS receiver. 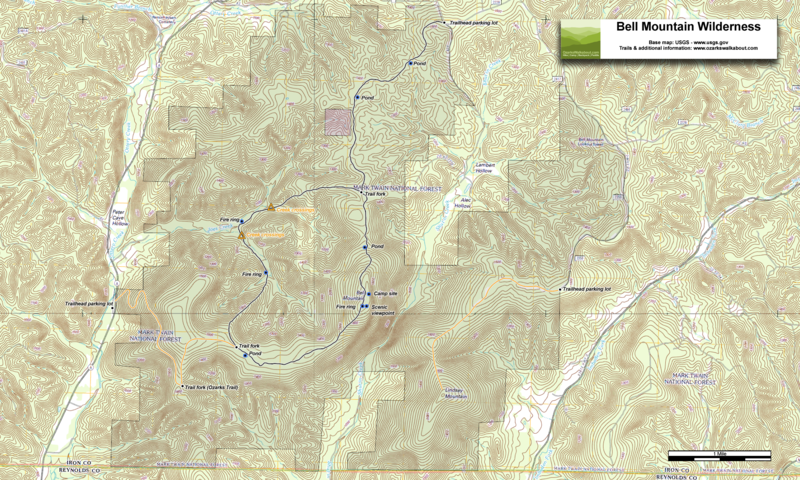 The KMZ file includes a full USGS topographic map of the Bell Mountain Wilderness area. Link to a down-loadable, printable, pdf version of the trail map. Starting fairly level from the north parking lot on County Road 2228 (Note this is just a wide spot on the road), going counter-clockwise this trail begins with a long fairly level run along a ridge until the trail joins the main loop (5.6 Miles) and then starts to descend more steeply down to Joe’s Creek. In the valley there are several creek crossings, and several camping places, some of which are quite well used. The climb out of the valley’s hard work until you get to the top of the ridge then it’s fairly even with a climb up to the mountain top. There’s a very well used and quite messy fire ring at the highest point. Do take the time to bushwhack to the glades to the east for a fantastic view over the valley of Shut-in Creek. Continuing on the trail the descent is a little rough but not difficult, and the point where the trail from the trailhead joins comes quite quickly. Mapped by GPS: March 18-19, 2012. The figures above are one-way from the trailhead to the ridge only. We’ve not hiked this trail – the 770 ft. climb convinced us to use the north trailhead. The track on the map is taken from a USGS Topo map. Once you get to the top of the ridge a complete loop is around 5.6 Miles. Giving a total hike of 10.92 Miles. There is room to camp at the Ottery Creek trailhead and plenty of parking. Mapped: Traced from USGS Topo map. Distance and elevation gain are for a round trip. We’ve not hiked this trail. The track on the map is taken from a USGS Topo map, and the figures from Google Earth. Google Street View of the entrance to County Road 2228 from State Highway A.
Ottery Creek Trailhead from State Highway A. Hey, lots of great info here but i still have a question im wanting to take my family of five to the top of bell mountain for an overnight my youngest is five. while she is a trooper for sure i dont want to put to much on her so that she dislikes it. what is the easiest route to the top? I’d start from the North Trailhead (on county Road 2228), and head south (Turn left at the trail Junction shown on the map). This trail still has its ups and downs – but you won’t have the 770′ climb that starting from Ottery Creek has. I wouldn’t go counter-clockwise as that involves a lot more distance and more descents and assents. A couple of things. (1) There’s not a lot of water to be had, so you’ll need to pack it in. There’s one stock pond marked on the map – personally I avoid standing water if at all possible (2) at the top of Bell mountain it is mainly rock so be prepared for a challenge finding places to set up traditional – non free standing tents. Hammocks and free standing tents should be okay. I am thinking about hiking Lindsey Mountain but cant seem to fins much info on the trail. I haven’t talked or meet anyone that has any experience on that trail. Does anyone have any stories or trail descriptions to share with me? good camping spots? views? blazed well? Anything would be appreciated. Thanks. We’ve still not hiked Lindsey Mountain, I’d be interested in hearing about the trail too.